SHINI Intelligent Flow Regulator SIFR is the equipment used for monitoring the water flow and temperature, which can work with the water heater, water chiller or cooling tower to monitor the mold water loop and obtain data. It is available to collect the temperature and flow data in production, providing strong support to achieve and improve the technology. When the product has defects, the problem can be eliminated by rapid positioning, thus fulfilling precision manufacturing with improved efficiency. The use of automated equipment production lines can effectively control costs, improve production efficiency, ensure product quality, and improve the overall competitiveness of enterprises. An electric company in Guangdong mainly is cooperated with Shini Automation Department, and the ST5 robots were ordered from Shini for automatic injection molding of Philips razor injection molded parts. In the same period, the whole plant conveying system was purchased, and the machine side conveyor belt was connected with the robot signal to realize fully automated operation. Planned converging conveyor lines and intelligent anti-collision system to effectively protect the appearance of the product and prevent surface defects caused by product superposition. After the equipment is put into use, the manipulator is stable in operation, and the cycle time of the injection molding machine is unified, the production efficiency and quality are obviously improved, and the customer is very satisfied. 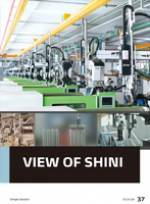 At last, any opinion about View of Shini is welcomed for us to improve the journal and to provide the technology of product and information of industry which you need. Intelligent Flow Regulator —— Your Flow Controller!